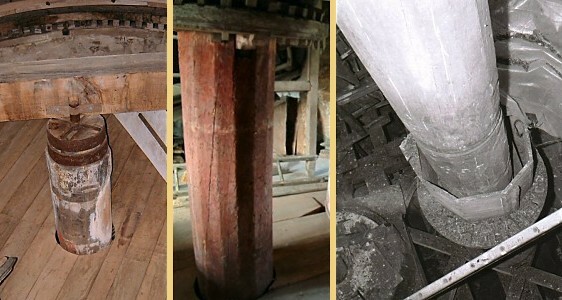 The Main shaft is a large vertical shaft of solid wood and its purpose is to be the drive shaft of the mill. It runs down the centre of the mill from the base of Cap to the ceiling of the Ground floor. Its purpose is to take the power supplied by the Sails and to transmit it to all of the mill machinery. The Wallower is attached to the top of the Main shaft and it is via this intermeshing with the Brake Wheel that the Sails' power is able to turn the shaft. At the other end of the shaft is the Spur wheel and it is this that is used to provide power to the Millstones. Along the way there are also power take-offs for both the Boulter and the Auxiliary drive for the Ochre grinder.